Eleven-year-old Riley (voiced by Kaitlyn Dias) has had a pretty stable and happy life so far until Mom (Diane Lane) and Dad (Kyle McLachlan) decide to move from the comforts of small town Minnesota to the busy-buzzin’-bustlin’ San Francisco. Out of the five emotions headquartered inside Riley’s brain, Joy (Amy Poehler) has managed to keep things under control. That is, until the life-changing move that threatens the status quo—starting with Sadness (Phyllis Smith) being unable to keep herself from touching the little girl’s core memories, thereby turning otherwise positive memories negative. 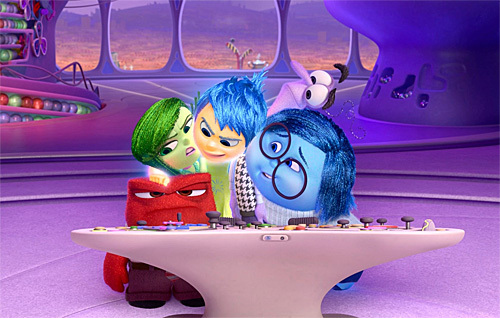 “Inside Out,” directed by Pete Docter, is a picture worthy of the Pixar brand because although it is entertaining on the surface, there are important messages behind the story that are worth ruminating after the film is over. One lesson, or reminder, I took away from it was maturity is being able to wrestle with tough challenges and learning from them, even just a little bit, so that when similar difficulties arise the future, one is more equipped to handle a situation—not necessary walking away from such challenges untouched or unscathed. Children younger than eight or so will probably not recognize the lessons it has to impart which is why the material must be first and foremost entertaining. The animation is easy on the eyes. For example, the first shot of the picture is a newborn baby. It has a surprising level of detail—almost tactile, appropriately soft and precious. Compare such an image to baby Jack Jack from the now Pixar masterpiece “The Incredibles” just a decade ago and the difference is astounding. As expected, the palate is colorful when appropriate but notice but how the colors are significantly brighter and more alive inside Riley’s mind compared to her reality. It gives the impression that anything is possible when we are inside her head. The five personalities are adorable in terms of character design and voice work. These are characters I can imagine kids will recognize five or ten years from now. Fear (Bill Hader) and Disgust (Mindy Kaling) have their charm, but Anger (Lewis Black) is my favorite because although he is the shortest of the bunch, he is perhaps the most overdramatic. Any little annoyance sets him off and I looked forward to his reactions when Riley encounters a potential source of trouble. I wished, however, that the screenplay had given each personality equal attention. In this installment—and I can imagine the film having a sequel for an excellent reason—Joy and Sadness are front and center. Still, the interplay between these two is highly amusing. It cannot be denied that the picture is at the top of its game when we get a chance to peek at the personalities inside other characters’ heads—whether it be a cat, a dog, or a teenage boy. Thus, the dinner scene with Mom, Dad, and Riley is perhaps the best in terms of energy, creativity, as well as a quick summary of this story’s essence. Compared to a child’s, notice that the personalities in adults’ minds are more collaborative and at ease around one another. They are sitting down in front of the monitor instead of standing up and running around. Not very many things surprise them anymore when it comes to each other because time and experience have allowed them to reach a level of relatively stable sense of equilibrium. There is a sense of trust and comfort among them that the younger counterparts do not yet have. That is another reason why I think it is worth making a sequel. Based on the imaginative screenplay by Meg LeFauve, Josh Cooley, and Pete Docter, “Inside Out” is possibly one of Pixar’s most human films. It is worthy of analysis not just in terms of how solid it is as a movie but also in terms of how growing up—even just a little—can turn one’s world inside out and upside down. I look forward to an even stronger second installment which absolutely must happen because the possibilities of comedic, dramatic, as well as other complex human elements and situations are ripe for the picking. I enjoyed the review Franz! I agree with many of your points. I just wonder why you gave this a 3/4. You gave only one negative criticsm, which was that you wanted more interplay between the 5 emotion characters.